Sharp as a whip-crack, the shot echoed through the mists in Hanover Square. The mob in the square boiled apart, flinging sticks and pieces of brick as they fled the line of cavalrymen who’d entered the far side of the square. I hugged a rain-soaked wall as people poured past me, bumping and shoving in their panic as though I weren’t six feet tall and plenty solid. The square and the streets that led to it had been bottled with traffic all afternoon: carts, carriages, horses, wagons, and those on foot who’d been running errands or passing through, as well as street vendors crying their wares. The mob had stopped traffic in all directions, trapping inside the square those now desperate to get out. They scrambled to get away from the cavalry and their deadly guns, and bystanders scrambled to get away from the mob. I scraped my way along the wall, rough stone tearing my cheap gloves, going against the stream of bodies that tried to carry me along. Inside the square, in the eye of the storm, the cavalrymen waited, the blues and reds and canary yellows of their uniforms stark against the fog. The man who stood in their gun sights had led the mob the better part of the afternoon: shouting, cursing, flinging stones and pieces of brick at the unfortunate house that was number 22, Hanover Square. Now he faced the cavalrymen, his back straight, his gray hair dark with rain. I recognized the lieutenant in charge, Lord Arthur Gale of the 24th Light Dragoons. A few years before, on a Portuguese battlefield, I’d dragged young Gale out from under a dead horse and sent him on his way. That incident, however, had not formed any camaraderie between us. Gale was the son of a marquis and already a social success, and I, the only son of an impoverished gentleman, mattered little to the Gale family. I did not trust Gale’s judgment one whit. He had once led a charge so hard that he’d broken through a solid line of French infantry but then found himself and his men behind enemy lines and too winded to get back. Gale had been one of the few who’d returned from that charge, leaving most of the others, horses and men alike, dead. He pointed at the house–Number 22, ground-floor windows smashed, front door’s black paint gouged. I studied the house in some surprise. 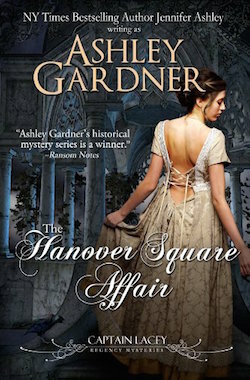 Any man who could afford to own, or lease, a house in Hanover Square must be wealthy and powerful. I assumed he was some peer in the House of Lords, or at least a rich MP, who had proposed some unpopular bill or movement, inspiring a riot against him. The rising price of bread, as well as the horde of soldiers pouring back into England after Waterloo, had created a smoldering rage in those who suddenly found themselves with nothing. The anger flared every now and then into a riot. It was not difficult these days to turn a crowd into a violent mob in the space of an instant. I had no idea who lived in number 22 or what were his political leanings. I had simply been trying to pass through Hanover Square on my way to Brook Street, deeper into Mayfair. But the elderly man’s quiet despair and incongruous air of respectability drew me to him. I always, Louisa Brandon had once told me, had a soft spot for the desperate. Gale made a sharp gesture to the cavalryman next to him. The man obediently dismounted and strode toward the gray-haired rioter. “I advise you to go home, sir,” Gale repeated. His desperation reached me as white mists moved to swallow the scene. The blue and red of the cavalry uniforms, the black of the man’s suit, the bays and browns of the horses began to dull against the smudge of white. “Get out of it, Captain,” Gale said, his mouth a grim line. I regretted speaking, unsure I wanted to engage myself in what might be a political affair, but the man’s anger and despair seemed more than simply mob fury over the price of food. Gale would no doubt arrest him and drag him off to wait in a cold cell for the magistrate’s pleasure. Perhaps one person should hear him speak. “What has the man in Number 22 done to you?” I repeated. I watched madness well up in his eyes. With a fierce cry, he turned and launched himself at the door of number 22.